Khachapuri may be the most popular food in Georgia, and each of its many regions has its own distinct style. 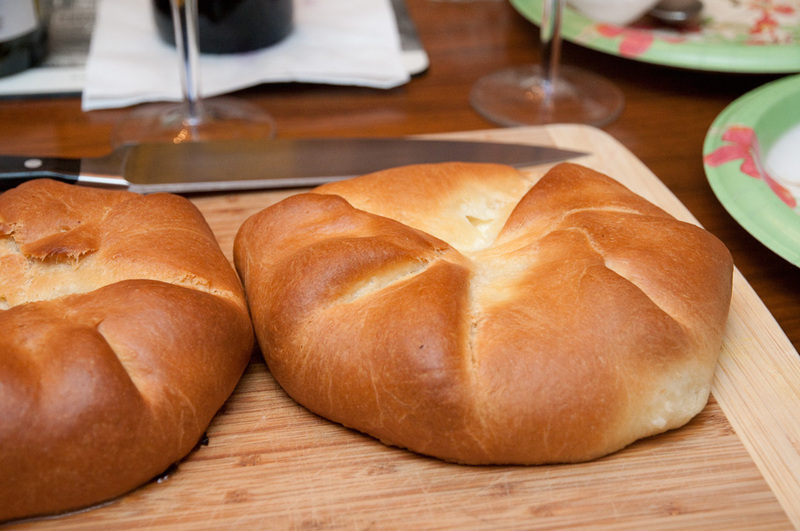 Imeretian khachapuri, the most common, is circular and filled with cheese. Mingrelian is similar, but with more cheese added on top. Adjarian khachapuri is shaped like an open boat and topped with a raw egg. Abkhazian khachapuri (Achma) is made of multiple moist layers of pasta-like dough, almost like lasagna. Ossetian khachapuri has potato in the filling. The economics school at Tbilisi State University has recently developed a “khachapuri index” to measure Georgian inflation, using as its market basket the limited set of ingredients used to make khachapuri, including the energy used to power the oven. This recipe is a combination of the dough used in Darra Goldstein’s recipe in The Georgian Feast (the ultimate Georgian cookbook, in my opinion) and my favorite filling from Anya von Bremzen’s recipe in Please to the Table. The picture above is what I produced yesterday. It was very good, though not exactly the most common look. 2. Add the butter, coriander, salt, and flour, and mix well to form a dough. Knead the dough for about 10 minutes until smooth, and place in a greased or buttered bowl, covered with a damp cloth, for 60-90 minutes or until doubled in bulk. 3. While the dough is rising, mix the filling ingredients together until smooth. If your feta is fairly salty, you should not need additional salt. Taste to check. 4. Preheat oven to 375° F. Punch down the dough and allow it to rise for another 45 minutes until it is again doubled in bulk. 6. Place the breads on a parchment-lined baking sheet and let stand for 10 minutes, then brush with melted butter (optional) and bake for 45 minutes or until browned. Serve hot or at room temperature. This entry was posted in Breads, Salads and Sides and tagged Cheese, Georgian, Pie by Baron. Bookmark the permalink.